Organizations involved in emergency response and emergency management are adopting NIMS (National Incident Management System) methodologies. As amateur radio operators and emergency communicators, we should adapt to the shift and adopt methods in support of NIMS. 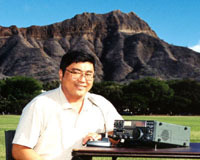 Many amateur radio operators active with emergency communications are familiar with the ARRL Radiogram and the NTS (National Traffic System) means of reading the message over the air and handling the message. There is no similar technique for handling ICS-213 messages or other non-ARRL Radiogram messages. Enjoy, and feel free to drop me an e-mail if you have any questions. Remember that the number one objective by anyone on the team is to forward the message(s) to its final destination. Remember the mantra: "Move the message forward." Use this to focus and concentrate when you're totally exhausted and can't think clearly. In order for you to be effective, your partner also needs to know exactly what you'll be doing so there is no on-the-air confusion -- especially when fatigue starts to set in. Normally, formal messages are passed using daily communications technologies such as fax, email, cell phones and instant messaging. As emergencies and disasters grow, these communications techniques progressively fail to vulnerabilities such as interruption of electrical power, down utility poles and telephone lines, and loss of antennas at cellular telephone sites. Under such circumstances, agencies with radio communications become increasingly reliant on their radios to pass informal and formal traffic. For passing formal traffic between agencies during such times, there is a good chance that amateur radio operators and their equipment would be used if they were available. In the absence of an on-the-air standard for passing formal messages, below is a proposed means of sending the ICS-213 message over the radio. It can adapt to any message format, as it does not require a word count to verify the number of words in the message or other means of message checking. It is not completely efficient with the amount of radio air time, but it is effecient in terms of being embraced by untrained or uncoordinated radio operators during the onset of an emergency, which is of equal if not greater concern. Timeliness and accuracy are key! Pass this page along to your partners, and begin the training now. Formal messages, which are originated locally, are "record communications" which are public records and part of the formal incident log maintained by the served agency. The most important features of a formal message are: (a) the date and time of the message, (b) the originator or sender of the message, and (c) the intended recipient or addresee of the message. (d) the message body or content. The NIMS ICS-213 message form is the standard for inter-agency messages during emergencies and was originally for use within an EOC (Emergency Operating Center). As a result of trials at passing the message over the radio, a Microsoft Word version of the ICS-213 modified for communications with radios was developed. You may download an editable PDF version of the modified ICS-213 form. Note: This ICS-213 PDF file is now editable PDF in Adobe Acrobat! An example test message in the ICS-213 message format shows you how a typical formal test message would appear. The content of the message is relayed in sequence: top to bottom, left to right. It takes longer to write a message than it does to read it. Therefore, the sending station needs to pace the reading of the message so that the receiving station has the time to cleanly and accurately write the message down. Each exchange on the radio consists of the originating operator reading one item or sentence from the form over the air, the receiving operator writing down the item or sentence then reading the item or sentence back over the air, and if the copy is correct the originating station moves on to the next item or sentence. The originating operator should break up sentences into phrases of about five to six words and release the PTT (Push-to-talk) switch and listen for the response from the receiving station to ensure he/she has copied that portion accurately and is not requesting a repeat. The originating operator can pause for about two to three seconds listening for a response, and hearing none, can move on to the next phrase of five to six words. If the receiving operator has a good copy, he/she can say "Copy" or "Go ahead" to signal the originating station to resume reading the next phrase. This is especially helpful after copying unusual or difficult words. Skilled receiving operators will say "Copy" while writing the last words to cut down the overall time. The two operators can adjust this exchange according to how well they are passing the message. The originating operator should make an effort to spell out unusual names and words. He can do that by saying "I spell" followed by the spelling. The preferred phonetic alphabet is the ITU (International Telecommunications Union) phonetics, also known as the ICAO (International Civil Aviation Organization) phonetics. Punctuations are important! In the message, the originating operator should say (pronounce) each punctuation, such as a period, comma or question mark. Do not say "X-ray" as a replacement for the period at the end of the sentence. If the receiving operator has a problem, that operator can request a "fill" (selected repeat of the missed item, short for fill in the blank) by saying "word before", "word after", "all before" or "all after" and call out the word or phrase to help locate the section. If you don't want to have to relay your entire message when the receiving party calls out "say again all after xxxx", make sure you take the time to pace the rate at which you say your message the first time. In an EOC environment, there is a lot of noise and distraction that makes receiving and copying a message difficult. If you didn't hear the transmitting station clearly, say "say again" to request that station retransmit his message. Do not say "repeat", as that is a military command proword for artillery fire discipline control to fire again on the same target coordinates, and is never used in radio communications except for that purpose. Because the originating operator already has the message already written, on readback, the receiving operator can read back the item or sentence rapidly. If the receiving operator copied the item or sentence incorrectly, the originating operator can assist the receiving operator getting it corrected by repeating and emphasizing the section that is in error. The end of message is marked by the originating operator saying the procedural phrase "End of message". As the operators become more experienced, and if the communications link is free of noise, you can forego reading back the line to the originator and just acknowledge receiving the line by saying "Copy". Dates and times are examples of items commonly acknowledged by saying "Copy". In this exchange, operator "A" is the originating station, and "B" is the receiving station. This is an example exchange between two stations that are not practiced and skilled in sending messages over the radio. Notice the items in bold, which is what the stations are expecting to hear and exchange. Also be ready to hear and work through exceptions such as word before, word after, all before, all after which can happen when there are distractions at the receiving end. The exchange begins with the originating station creating a partial entry in the outgoing message log. The originating station then contacts the receiving station. B: The receiving station creates a partial log entry in the incoming message log. Ready to copy. If the operators were very skilled and the conditions good, Operator B would be saying "Copy" more frequently and reading back less often. After the message has been sent, the originating station completes the "Sent to" section on the bottom of his/her form, and completes the entry in the outgoing message log. Completes the "Received from" section on the bottom of his/her message form. Completes the entry in the incoming message log. Make a copy of the incoming message, if possible. Forwards the message to the person(s) taking action on the message. The ARRL Radiogram has been around for many years, and is the common means of moving short written messages over the air and is familiar with many amateur radio operators. Here's an example test message in ARRL Radiogram message format. Notice this format includes a check, which is the count of the number of words in the message to ensure that nothing was added or deleted inadvertantly. If you find you have to send an ICS-213 message to another person not familiar with message handling, just instruct that person to write down each word, phrase or punctuation mark as you say it. Instruct them to read back the phrase to ensure that they copied it accurately. After a few sentences, the receiving person will catch on. Some groups have modified the ICS-213 to include word count checks, similar to the ARRL Radiogram. Keep in mind that it will facilitate radio operations by the radio operators trained in the use of the modified forms, but will limit the effectiveness and cause confusion when attempting to use it with other agencies. If you use modified ICS-213 forms, make sure your operators can also handle the unmodified forms.